"Godspeed. How is your pain?" Capt. Katherine Gardener leans over a wounded soldier to murmur words of comfort. This quiet 29-year-old Air Force trauma nurse is watching over several young wounded soldiers lying on stretchers in front of her. But we are not in a hospital. 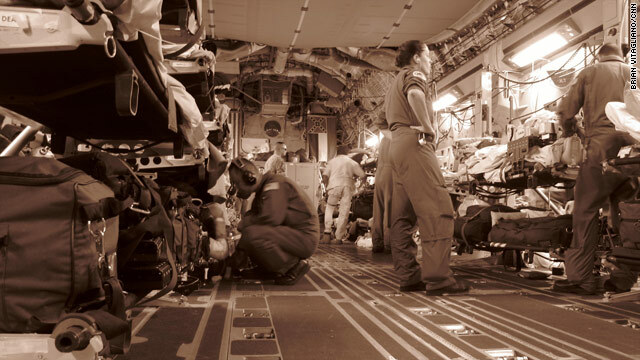 We are on a C-17 cargo aircraft at 40,000 feet in the middle of the night. A prominent Republican on the Senate Armed Services Committee is praising President Barack Obama's approach to fighting terrorism in Pakistan. However, Sen. Lindsey Graham, R-South Carolina, is also worried that conservatives and liberals could join forces to undermine Obama's efforts in Afghanistan.